The magazine is exceedingly critical to the function of a 1911, and all too many shooters induce problems in otherwise functional guns by using faulty magazines. My number one recommendation for a 1911 magazine is the original Chip McCormick Power Mag 8 round magazine with the standard (.350") bumper. The Power Mag design has a durable tube that holds its shape well, a strong spring that resists a set when left loaded for extended periods, and very good overall function. The Power Mag features a flush length tube, which makes it a good choice for concealment applications. It is able to compete in function with extended tube magazines thanks to the additional spring pressure provided by the folded follower. I have had hundreds of Power Mags pass through my hands - they work well and you simply will not find a better value for your dollar. I am frequently asked whether I recommend the original Power Mag follower or the newer Power Mag Plus. I prefer the original Power Mag follower for most of my applications. You will need to decide for yourself which of the two followers has design characteristics that better suit your needs. The original Power Mag follower provides greater lift to the slide stop at lockback, and jumps forward slightly upon feeding the last round. If you have a gun that has a heavy slide stop plunger spring or one with a hard detent cut into it, you will probably do better with the original Power Mag. The Power Mag Plus follower produces somewhat less lift on the slide stop lobe, but its primary design features are that it does not jump forward in the tube and also rides very tightly up the inside front of the tube for more consistent follower engagement. When the follower jumps forward, it can put a slight ding in the frame below the feed ramp. This slight ding causes many shooters some consternation, but since the ding is below where the bullet strikes the frame, it is merely a cosmetic issue. I have many high mileage guns that have run the original Power Mags without any feedway issues from the follower strike. The Power Mag Plus is what CMC recommends for alloy frame 1911s, as many users prefer not to have the follower strike the softer aluminum frame. The new blackened stainless Power Mag, released at 2013 SHOT, has superseded the original black carbon steel Power Mag, and has been positive in initial testing. The older black oxided carbon steel Power Mags were good magazines, but they rusted easily in high humidity environments. They are no longer available, but if you are not experiencing rust issues, those mags are good to go. We will be continuing with extended testing of the black stainless Power Mags, and expect them to be the equal of the original stainless Power Mags. The Wilson ETM is the next of our recommended magazines. This newer design addresses the shortcomings of the popular 47D, which was an excellent competition and recreational use magazine, but fell somewhat short in regards to service use. The 47D suffered from premature spring fatigue, rapid follower wear, and feed lip spread. The ETM addresses these issues and produces a superior solution to the 47D. The ETM tube is longer to lengthen the spring column, and has design changes to improve the dimensional stability of the feed lips. The follower tracks more consistently up the left side of the tube for better lockback, and does not wear excessively from contact with the slide stop. I have found that the ETM spring provides sufficient tension for about six months of staying constantly loaded, after which it may not consistently lock open some guns. The Tripp Industries Cobra Mag, A8-MG, is another good candidate for an 8 round 1911 mag. It uses a polymer follower with a steel insert at the slide stop lobe engagement shelf that provides good durability. The tube is extended in length for a longer spring column. These magazines tend to sit very high in the gun, so you will want to check to see if the feed lips or top round contact your ejector. The current manufacture Cobra Mags with the polished tube are superior to the original versions with the matte finish tube. Ten round magazines are a bit of a mixed bag with 1911s. Due to the taller, heavier column of rounds, they create additional issues that you do not get with 8 round magazines. The top round will tend to nose dive more during feeding, and if your feed ramp is not able to support this, then you will have constant feedway malfunctions, especially on the first round out of the magazine. Feed lip wear/spread is dramatically accelerated during slide lock reloads, as the column of rounds striking the feed lips is heavier. 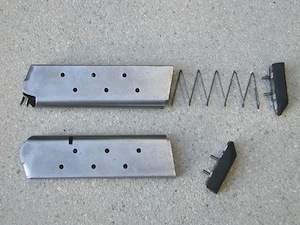 Springs can also fatigue much faster in these magazines. These issues make the 10 round magazine a much bigger maintenance issue and require an extremely diligent user for them to be used successfully. I have had success with the CMC Power Mag 10 round and Tripp Cobra Mag 10 round, but due to the above issues and shortened service cycles, I do not typically recommend 10 round magazines for most users. **I no longer recommend the use of the Tripp Super 7 kits inside a CMC magazine tube as a home made "super mag." There is nothing wrong with this setup, but current developments with the above listed magazines have outstripped that suggestion (which dates back to 2005). It is my feeling that the day of the 7 round magazine in a full sized Government Model has passed, and that the added expense and trouble of rebuilding the magazines is unnecessary. 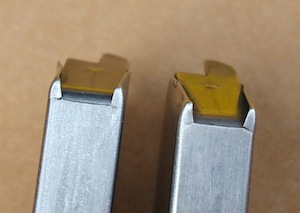 Your 1911's slide stop will play a large role in the overall success of your magazines. The slide stop lobe does a lot of work, and if it is not dimensioned correctly, you may have problems. 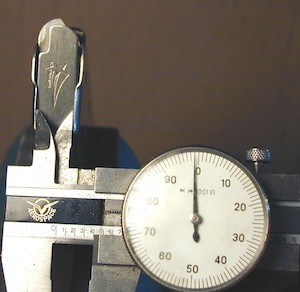 In a .45, the lobe needs to protrude .200", as measured from the back of the interior of the slide stop lever, and assuming installation into a gun with an in spec frame/mag well. The Devel style folded follower in the CMC Power Mag series has some isolated problems with certain guns where it will jump the slide stop. If you have this issue, it is indicative of your slide stop lobe being too short, and the 100% solution is to replace the slide stop with one that has a correct length lobe. In the Tripp and Wilson magazines, a short slide stop lobe can be bypassed by the follower. This can create some interesting malfunctions, including one where the slide stop gets pushed to the left (ie out of the gun) during firing, causing it to bind the gun up tightly. 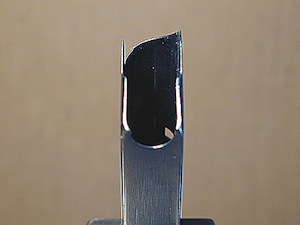 In the Wilson 47D magazines, routine wear to the polymer follower can create this malfunction or at least the bypassing of the slide stop lobe once the follower has worn enough. On these magazines, it is critical to stay on top of follower replacement. For duty use, the above are the ONLY 1911 magazines that I currently recommend. There are certainly many brands of magazines which work well for various users and applications, but I haven't had the opportunity to wring out every design, nor has every magazine survived my evaluation. Omission from recommendation does not mean condemnation on my part, but it certainly does mean a lack of endorsement. Keep in mind that my recommendations are based upon large (ie. statistically relevant) sample sizes that meet my stringent requirements of the magazines being kept constantly loaded for a duty cycle of at least 6 months, performing during high volume use with ball and JHP ammunition, and being able to withstand repeated drops onto hard surfaces during training. Almost any magazine will work satisfactorily if you never leave them loaded, shoot only ball ammunition, and they are not dropped on concrete. Following are some common failure points in magazines, so you can have a better idea of why certain magazines get pulled from service. The magazines pictured below were both broken on the same day, and had only been in service for about two weeks. Another one of the user's mags from this set had broken this way in the previous week. The poor quality spot welds holding the floorplate in place had broken, jettisoning the entire contents of the magazine out the bottom upon either insertion in the gun or impact with a soil surface. After seeing a lot of these failures, I tend to avoid any magazines with welded floorplates. Slide on floorplate magazines are also easier to disassemble for cleaning. The next magazines were representative of a compliment of magazines in use by a student at a shooting school that I had attended. This student was an avid hobby shooter that I had seen at a number of other classes, so I knew that he used his equipment. Unfortunately, he was not very diligent in his inspection of his magazines, and did not understand why he was always having problems with his gun. Removing these magazines from service solved the problem. Note how the feed lips are spread so far that the follower is almost able to pop out of the top of the tube. 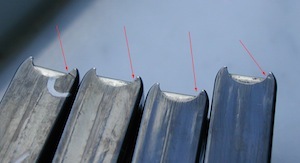 The red arrows below show where these magazines cracked at the rear of the tube, some within 100 rounds or even less. Function was not affected up until the point at which these cracks were discovered. I have used some with known cracks to see what would happen, and the net effect after a while is that they behaved much like other mags where the feed lips spread. The tube will stop falling free because it is spread up top, and it can also induce some ejection failures where the lips will catch the casing on its way back to the ejector. Feeding can of course be compromised if the feed lips spread far enough. The problem with these magazines lies in the heat treat of their tubes, not with any mechanical incompatibility with your gun. Note how these feed lips are spread and belled out at the rear. This deformation can occur when the magazine is left loaded, and also from repeated slide lock reloads where the column of rounds accelerates against the feed lips. This next photo shows how to measure the feed lips, across from inside to inside. These feed lips measure .399” across. New magazines typically measure about .375" and the lips are parallel. Once the lips start to get to about .390" or they are deformed such that they are no longer parallel, the magazine needs to come out of service. This particular magazine was starting to age, but the coup de grace was when it was paired with some marginal extractor tension that caused the spent casing to be dragged through the feed lips, causing the bulge that is evident on the left feed lip. The magazine was taken out of service after the malfunction was cleared. Another clue for magazine tube failure is when a tube that used to fall free starts sticking in your magazine well. An immediate stopgap fix is to apply some rubber mallet to the tube to flatten it back out, but the problem will eventually resurface. Such a magazine is headed for failure, so it should be taken out of service. Also pay attention to the front of the floorplate/basepad. With enough slide lock reloads, some units will start to bend downward, allowing the magazine to rise higher in the gun than intended. This can lead to damage to extended ejectors as well as wedging of the magazine inside the frame. This downward bend can also eventually become a breakage, so head it off before it creates other problems. Note that all the major magazine manufacturers have a good warranty on their products, and you can typically get defective magazine tubes replaced. Magazines for the 1911 need to be considered an expendable asset, much like the GI aluminum M16 mag. I expect an average service cycle of 12-24 months, and I will not hesitate to replace them the moment one fails to feed or drop free. Don't get married to a set of mags, use them up and move on.